This site started out as a writing advice blog, and in the earliest days I spent as much time offering Technical Writing advice as I did talking about storytelling. It’s been long enough now that I suspect I’ve mostly lost the crowd that came around for tips on good professional writing, but today I want to dip a toe back in those waters. At the same time…I’m planning to tell a deeply personal story about my life experiences and my successes as a novelist and storyteller. So if that kind of thing is why you’re here, read on. Don’t let the title scare you away. I’m astonished to discover I may not have ever written a blog post just on writing business letters. It’s an old and well-established format, so maybe it’s just not needed, but when I taught Technical Writing, I did a whole lesson on why the boring ol’ business letter is still such an important tool. Each of those pieces should be separated with a significant amount of whitespace. The exact amount is almost a matter of aesthetics, but it should be at least a full line height. For general rules of business letters, you can do a Google search on “how to write a business letter” and find a hundred helpful tutorials. Today I want to talk about a particular (and particularly challenging) scenario: writing a business letter to your boss. I’ve said before that audience analysis plays a big role in any writing project, and that’s certainly true here, too. The trick is to take full advantage of the medium (the standard “shape” of the business letter) while also adapting its pieces to make sense in this particular context. So, for instance, the “sender contact info” might seem utterly superfluous (after all, your boss probably knows how to reach you), but the very fact that you’re sending a formal letter indicates something has changed from business-as-usual. Depending on the contents of the letter, it might be helpful to let your boss know how best to contact you concerning the issue at hand. If you’re going to be working off-site, for instance, you might include a mobile phone number or the address of the location where you’ll be working. A date is always useful on any correspondence, and the recipient contact info. (or “inside address”) is mostly there in case this letter gets handed around to others than the intended recipient, so that it remains clear to whom it was addressed, and in what capacity. That’s just as important when it’s your boss as when it’s a customer service representative at some company that’s done you wrong. Of course, the body of the letter is the most challenging here. Since you probably have a regular working relationship (which might be quite informal) with the recipient, it can feel awkward to suddenly accost them with formal writing. Again, bear in mind that you’re writing this letter to your boss, but you’re writing it in the knowledge that it might be read by anyone in the organization. That might sound paranoid, but it’s really the point of formal communication. When you provide a memo or a business letter to your boss, it’s something that can be put in a file drawer and pulled out again when Human Resources comes around for job assessments or the lawyers come around concerning a lawsuit. Remember that when you’re writing a letter to your boss: you’re also writing to a widespread, unanticipated readership. What you say (and how you say it) not only conveys immediate information from you to your supervisor, it also suggests all manner of “metadata” concerning the situation under discussion, not to mention your relationship with your supervisor. Of course, one of the best ways of teaching is by showing, so let me share with you a sample business letter I wrote to my own boss. You can see how I approached each of the elements described above. This letter will serve as official notice of my resignation. It has been my honor and privilege to work with the FAA and all our fine contractors for half a decade. I’d anticipated being here far longer, but my personal successes in the last year now call me on to brighter things. 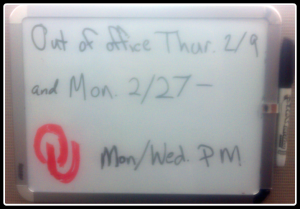 I intend to resign no later than Friday, February 24, 2012. I deeply appreciate the opportunities I’ve been afforded and the projects I’ve gotten to work on as an employee here. It’s an excellent place to work. That’s all for now. Come back next week, for a brief tutorial on cover letters for book proposals to high-powered New York literary agents. This was written by Aaron Pogue. Posted on Wednesday, February 8, 2012, at 6:50 am. Filed under For Fun, For Work. Tagged Aaron Pogue, Kindle Publishing, Master of Professional Writing, Technical Writing, Tips and Tricks, Unstressed Syllables. Bookmark the permalink. Follow comments here with the RSS feed. Both comments and trackbacks are currently closed. That is awesome Aaron. Congratulations! Hey thanks for the information which is really very useful and important.actually you described it in natural and in easiest way,So that one can understand what things we need to include while writing a business letter.